Gallia Academy sophomore Malerie Stanley fields a one-hopper and steps on second base for a force out, during the Blue Angels 10-5 win over South Point on Wednesday in Centenary, Ohio. CENTENARY, Ohio — One in the win column. 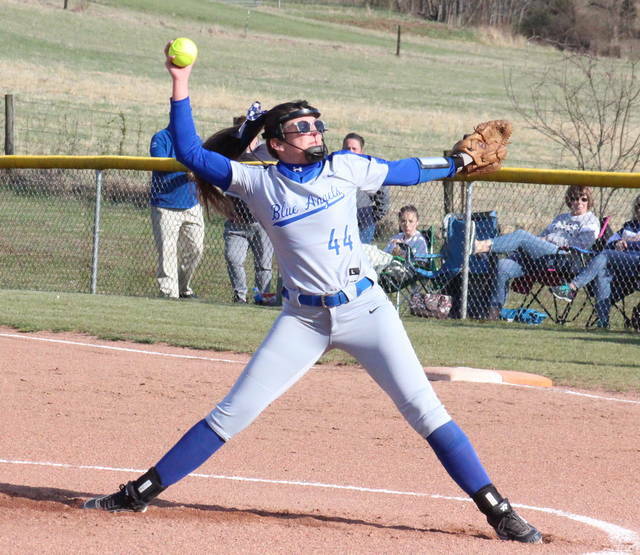 The Gallia Academy softball team snapped its six-game skid to start the season on Wednesday evening in Gallia County, as the Blue Angels knocked off Ohio Valley Conference guest South Point by a 10-5 tally. 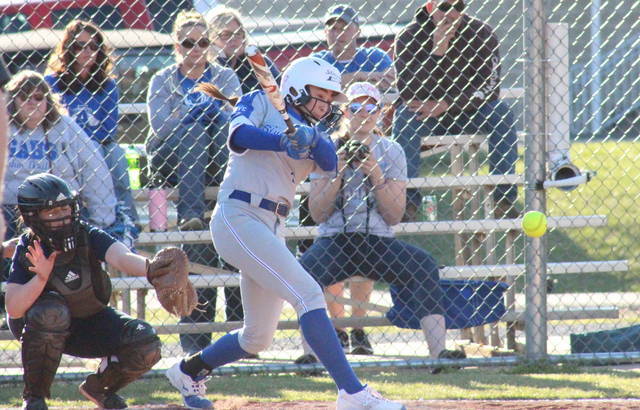 Gallia Academy (1-6, 1-1 OVC) trailed 2-0 after a pair of errors in the top of the first, but got both runs back in the home half of the frame, with Bailey Meadows hitting a two-out, two-run single. The Blue Angels took the lead in the following frame, as Hunter Copley scored on Kyla Miller sac-fly. A two-out single by Abby Hammons increased the GAHS lead to 4-2 in the bottom of the third, and then Miller and Alex Barnes scored after a trio of SPHS errors in the fourth. Gallia Academy added four more insurance runs in the fifth frame, combining three hits with two errors. 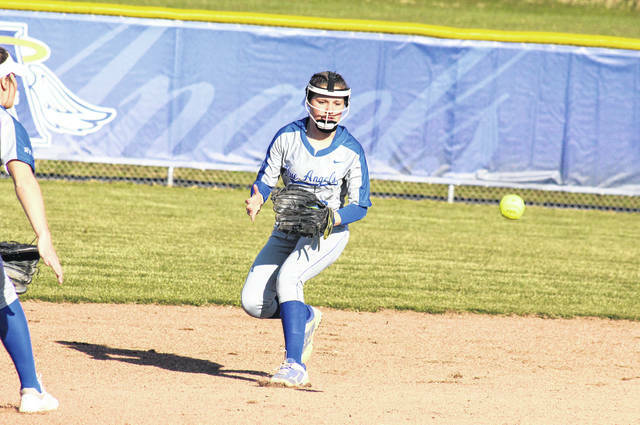 The Lady Pointers rallied for three runs in the top of the sixth, but left the bases loaded. South Point put two more runners on in the seventh, but couldn’t bring either home and fell by a 10-5 count. Copley was the winning pitcher of record in 5.1 innings for GAHS, striking out five batters and allowing four runs, two earned, on five hits. Meadows finished the game in the circle for the hosts and picked up the save, striking out three batters and allowing one run, on two hits and a walk. Byrd took the loss in four innings of work for South Point, allowing nine runs, three earned, on 10 hits and a walk. Ramry pitched the final two frames, allowing an unearned run and a hit. Both Lady Pointer pitchers claimed one strikeout. Chasity Adams led Gallia Academy offensively, going 3-for-4. Meadows was 2-for-4 with a run scored and two runs batted in, while Aubrey Unroe was 2-for-3 with a run of her own. 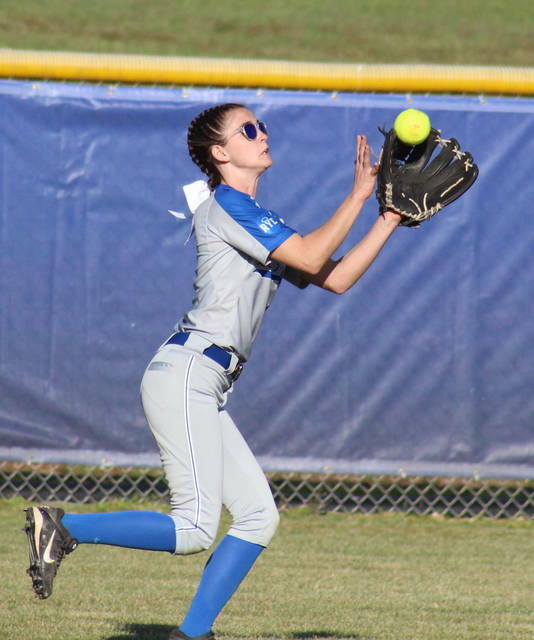 Bailie Young singled once and scored twice for the victors, while Alex Barnes and Malerie Stanley both singled once and scored once, with Barnes earning an RBI. Miller contributed one run and two RBIs to the winning cause, while Copley chipped in with two runs. Byrd led South Point at the plate, going 4-for-4 with two RBIs. Ramry was 2-for-4 with a run scored, Dickess singled once and scored once, while Estep earned a run and an RBI. Ellison and Allen both scored one run in the setback, while Aylsworth claimed an RBI. GAHS committed four errors and left five runners on base, while SPHS had six errors and nine runners stranded. Gallia Academy will look to make it a season sweep when these teams meet on April 19 in Lawrence County. Next, the Blue and White visit Rock Hill on Friday.